One of the great things (and there are many) about eating in New York City is that you can find amazing food at any level of price and formality, from grand Michelin star restaurants all the way down to food trucks. The quality and variety of street food sold in New York has increased enormously in the past few years. There is so much more than available than typical hot dogs and pretzels. On the streets of Manhattan, you can get jerk chicken, dumplings, kati rolls, bulgogi, falafel, souvlaki, schnitzel, couscous, cupcakes, waffles, fancy burgers, cheese steaks, Mexican and Korean tacos – just to name a few. 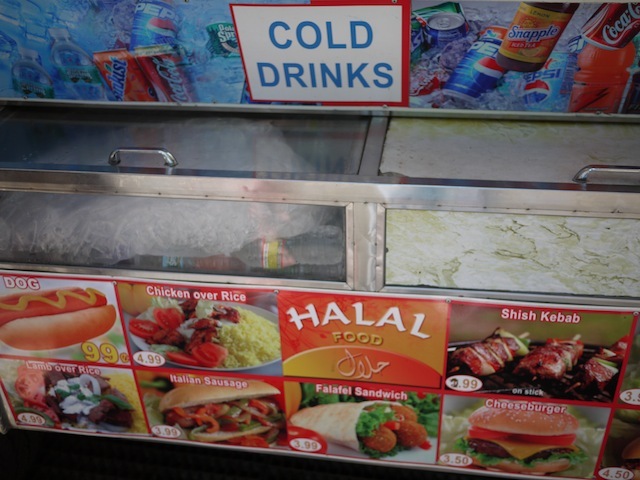 We tried a Halal Food street cart near Times Square. 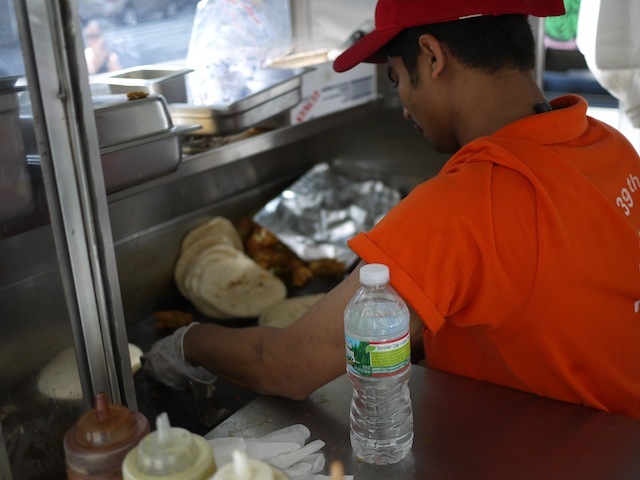 Halal street vendors are all over New York City, and a lot of them are in Midtown Manhattan. 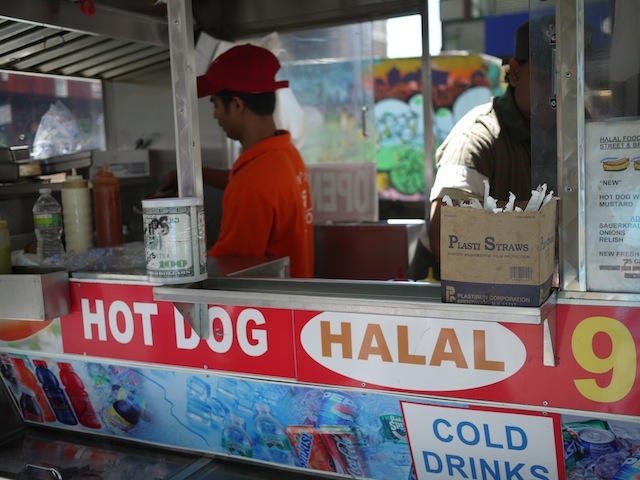 For those who are unaware, the term halal is used to designate food seen as permissible according to Islamic law – just like kosher food conforms to the regulations of Jewish law. This cart served everything from cheeseburgers to big falafel sandwiches to lamb over rice to Italian sausages, all for under $4.00. 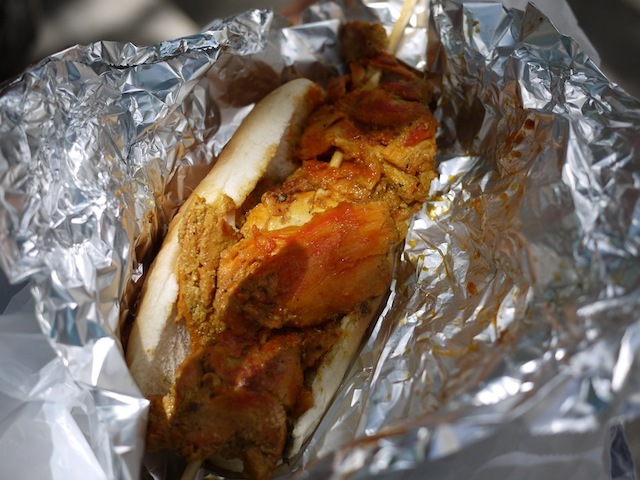 We tried a Chicken Kebab ($3.00) – Served in a hot dog bun, this skewer had marinated dark meat chicken, doused with hot sauce, and it was a quite a generous portion of meat for a small price. A delicious NYC snack on the go!